I don’t know about you, but whenever I see the words “Don’t Panic” I can’t help but think about the Douglas Adams book, The Hitchhiker’s Guide To The Galaxy. 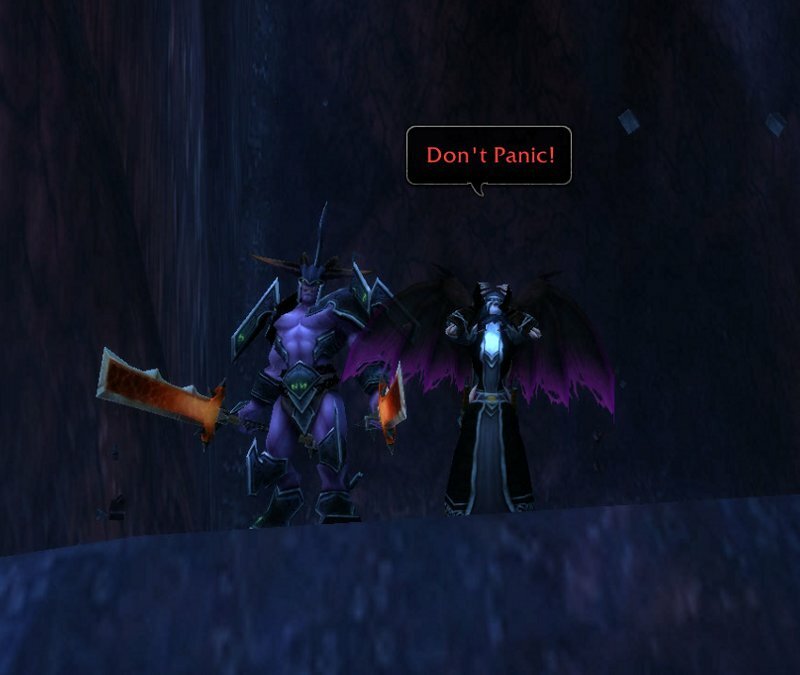 Well, like the immortal words imprinted on that wholly remarkable book we should all take a quick step back before the “OMG” patch hits and take it’s sage advice of keeping calm and not to completely freak out. Is it me or does the huge rush of information about the new patch and the upcoming MoP expansion seems to be overwhelming at times? There’s tons of excitement being generated from all of the WoW informational websites, personal blogs, Twitter and Blizzard Entertainment. Everyone I know is either diligently working to finish up bucket lists, leveling new toons, or they’re working on achievements and to grinding rep, raids and transmog gear. Keep in mind that I’m an old warlock, and I may rant and rave like a lunatic quite often, but hopefully you may glean a nugget of wisdom as we discuss some tips to surviving the massive changes headed our way. 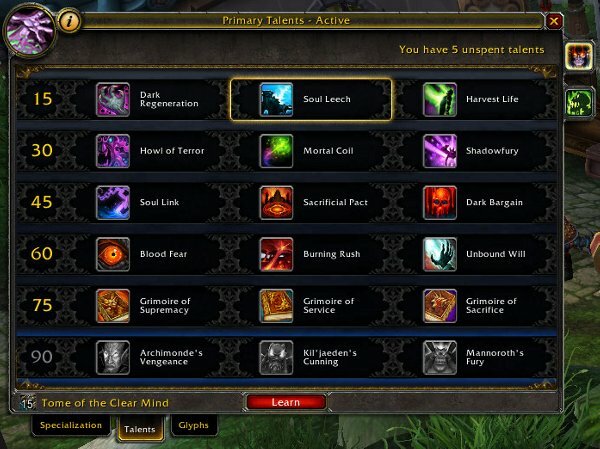 While many of the more famous addons for WoW have been updated during the beta process, it’s always a good idea to update them weekly. This patch and this week is no exception. Will the mods work perfectly? Probably not. Will they eventually work out the bugs? Yes, they will. So, any important patch is a great time to remind people to support the addon community by making a small donation to the developers of your favorite addons. Trust me, there’s nothing worse than watching a good addon fall by the wayside because the author could no longer afford to give away their time and energy to making and updating the addons we all love. You’ll need to pick your new specs! Choose your talents, but if you got the regents you can change as you need :) It’s soooo nice! Next, take some time and read over the new spells in your spell book. 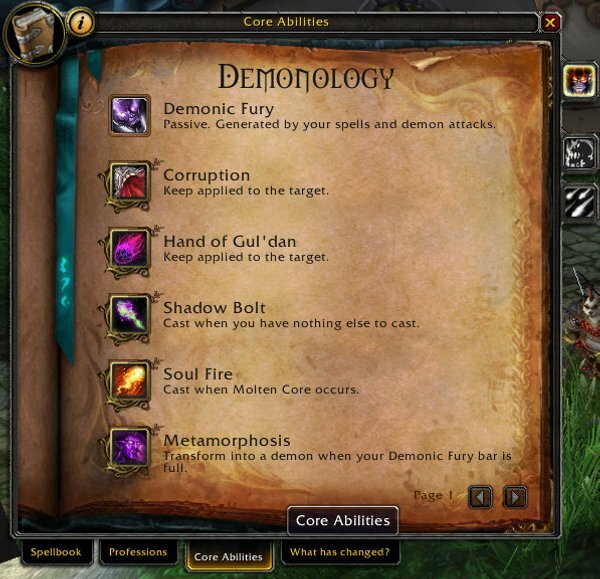 At this point, it’s probably a good idea to review all of the suggestions made by Blizzard inside the new Core Abilities Tab. It’ll help give you the basic foundation of your roations when you’re setting up your spell bars. Remember you don’t have to buy these items off the AH and in fact, I’d highly recommend against it. If they are listed on the AH it’s usually by a seller who is gouging uninformed players who either don’t know where to buy them or are too lazy to go find an Inscription Trainer for supplies. Save your gold by visiting the regeant vendor and pay next to nothing for these items. Example: Vanishing powder from the supplier cost 60 silver whereas on the AH in beta people were charging 5 gold each. Maybe I’m cheap, but hey…I work hard for my gold (and I’m always broke)! I know some players who truly abhor the idea of doing dailie quests, while some players absolutely love them. I don’t mind either way and only dislike daily quests whenever grinding rep turns into a second job. However, running daily quests can be a great way to practice your new skills. By running daily quests you can experiment and practice to find what works best for you. What’s also nice about doing dailies is that you can solo at your own pace, and you won’t have to worry about of making a mistake in front of others as you get a feel for your new power. Another great thing about questing is that you can make some decent gold while you’re out practicing. Not bad, eh? 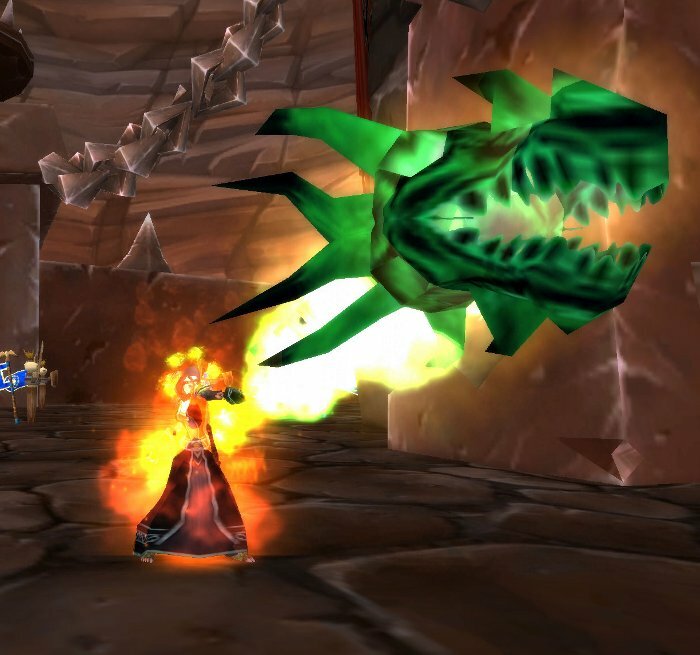 A trial by fire seems to works best for most people, and questing can help be the anvil to purify your Dark Arts skills. This is the kind of trial by fire I’m talking about! Woot! You gotta love the looks of the new Chaos Bolt spell! Yummy pain with a green face! The target training areas in all the major city hubs such as Stormwind or Orgrimmar are going to be crazy! I mean CRAZY! How crazy you ask? Well, try to imagine a mage convention where someone offered to give away a free dvd of My Pretty Pony to the person who could scream the loudest and longest. It’s going to be that nuts I tell you! Even being this close to the end of beta, the training areas have been packed. No to mention that depending on what time of day it is, it can often get worse during peak times. If you have a slower computer or a video card that doesn’t like crowds, I don’t recommend going there. Here’s a simple idea many don’t try because a lot players are too lazy don’t feel like traveling. Go to one of the empty cities. Remember them? I know we often forget about many of the old hub cities and only go visit them during a seasonal event, to put out a fire, or to go give praise to an elder. Each of those cities has a target dummy area and each city I visited in beta was either nearly empty or completely empty. Last night, in Orgrimmar there were roughly 25+ players at the training area at any given time. I took a quick flight over to UC and found only 1 person. I ported over the Silvermoon (yes, it’s still there btw) and I was alone. Typical for Silvermoon I know. It’s true, you can learn a lot from a dummy only if you can see it. So prepare for crowds! Outside of rogues every class will be facing some kind of change. 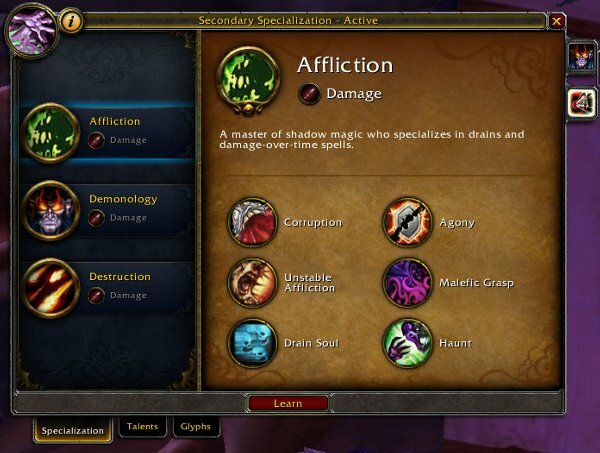 Everyone to some degree will be relearning their class and abilities all over again. So, when you decide to venture into a dungeon or a raid I’d highly recommend bringing along some friends and guildies. 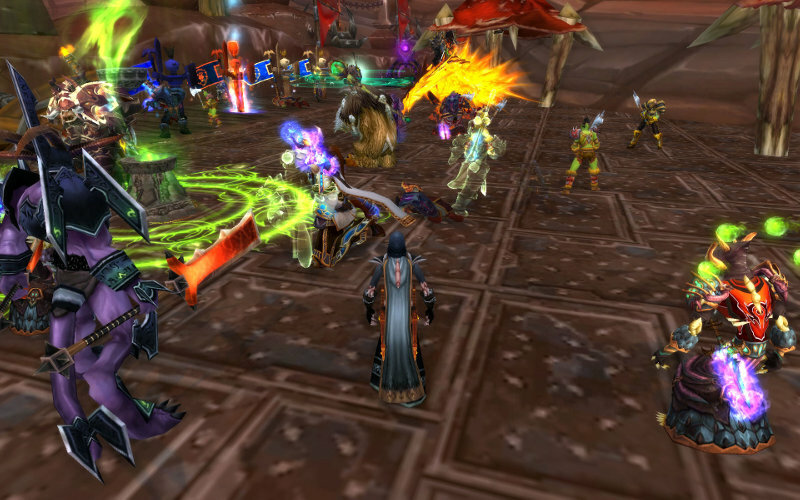 Remember what dungeons and heroics were like when Cataclysm first launched? Well, it won’t be quite that bad, but go easy and expect a few wipes. There’s a lot of great resources out there on the web regarding theory crafting. Sadly, I wish I was the type that loved digging through spreadsheets and calculations, but in all honesty that isn’t something I find enjoyable. Many sites offer great advice on how to get the best dps we can from our specs and many ask do you have to do it their way? No, not if you don’t want to. You’ll soon come to find that what works for someone else might not necessarily work for you. Knowledge is power. 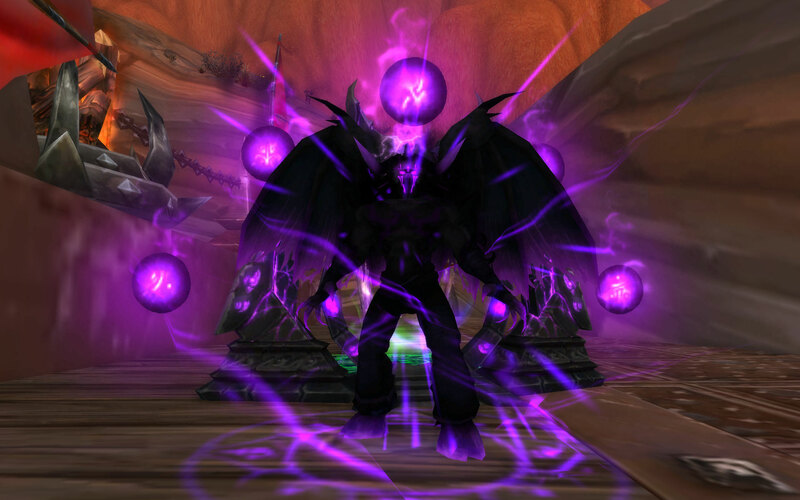 Read any and everything you can about warlocks. Then go out in the world of Azeroth and try and see what works best for you. I can’t wait to use these tools for dungeons and raids! Omg, tossing demonic portal on top of Demonic gate means you can travel a huge distance in 2 seconds! Putting a demonic portal between two gates means you can effectively cover a huge area as well! So, don’t be afraid to experiment and try out different things. Just because one talent sounds more appealing at first, it doesn’t mean the others won’t have their place as well. 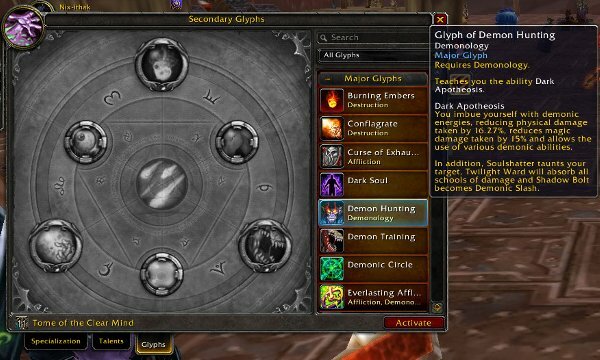 Remember, we can swap out talents and glyphs quickly so get used to being flexible. Doesn’t that sound smexy? Being flexible and adapting to any dire situation will make you a better player and it’ll make the other classes even more jealous of you and of the warlock class. That’s a win/win scenario for me! When it comes to our grimoires I really hope that the theorycrafting is off, because I hate the idea of using Sacrifice. I’m a Warlock and I want my pet alive dammit! Yeah, I hope they’re wrong to some degree too. From what I could read many of the tests were done in specific gear sets and they didn’t really talk about the fights. I would like to know if it was a Tank n Spank Patchwerk fight or if it was something that required a lot of movement. I’ve run enough stuff in this game to know that some fights require a lot of all out Dps burn, whereas some require mechanics and utility ftw. Sadly, high Dps has always been king and sadly I hope it doesn’t become a standard that you have to talent n glyph this way for this fight, and for this other fight you have to do it that way. I really think Blizz is trying to get away from that type of scenario. At least we can hope! I dunno why, but when I wrote that I thought of our mage-y friend Mr. Rivs. I don’t know about you, but I shudder when trying to imagine a scene such as that. However, when you come to think about it…that might be a good way to clear the roads on a PvP field? Don’t hate me Elk, but I accidently deleted your comment about the Tmog stuff :( I blame my spammy fingers for that one! I hit the wrong button when I went to approve it. Dang wordpress puts the buttons so close together on comments! Also, I have a question for you. Why is it at 2 or 3:00 am I never see a spelling or grammar mistake on a post I’m about to submit? I come back 24 hours later and then it’s all I can see? Omg…I really need to wait 24 hours before I try to make my personal Sunday night post deadline! 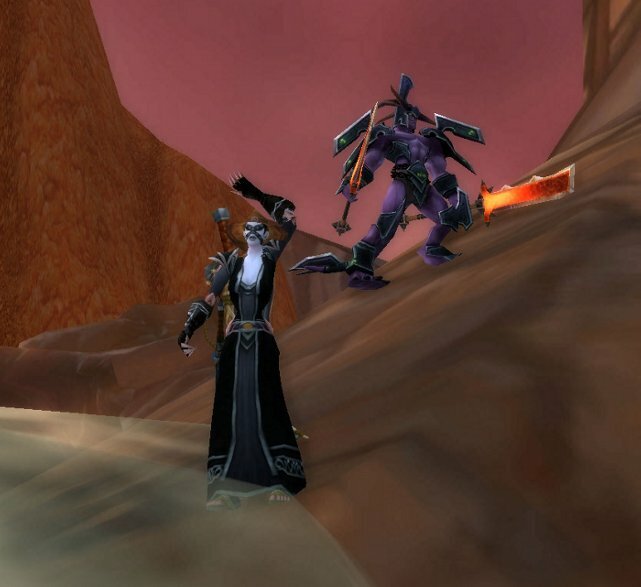 See More Horrifying Warlock Tmog Reviews!